. : Bakolas S.A. - Metal Buildings, Ioannina | Company profile - About Us:. Our company "BAKOLAS S.A." was founded at Ioannina, by the president of the board of the directors (CEO) Mr. Panagiotis Bakolas, with a main activity in the construction of metal buildings as well as similar projects development. Since 1980 our company has a constant expanding as it has managed to achieve to be recognised as a pioneer in its sector, as well as to be respected by the customers. Our key points are the reliability, the consistency as well as the responsibility that we have always showed during our constructions and projects development in every part of Epirus, the Western Greece and Albania. 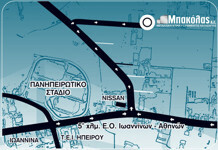 The constant as well as the dynamic development of the company, the expanding in other areas of Greece. Also, we would like to have the company as the most known in the industry, in its sector, so our products and our services to be recognised as a milestone in the industry of metal buildings and similar projects. 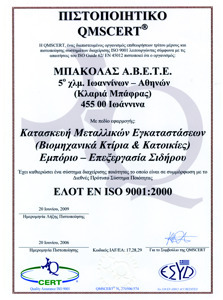 Our company BAKOLAS S.A. is certified according to ISO 9001:2000. Our staff is always responsible and reliable, as well as proficient and skilled in our sector (metal buildings), ready to undertake every constructural challenge and to satisfy every demand with absolute accuracy. 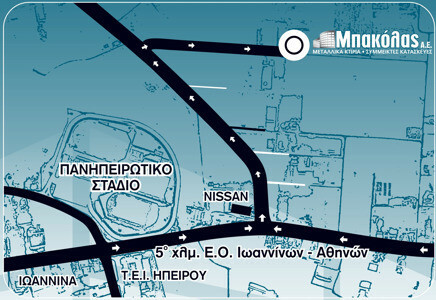 All the constructions of ours are made using the best materials from the greek buildings industry. All of the materials that we use are always certified for their quality and their genuineness, from recognised certification authorities.